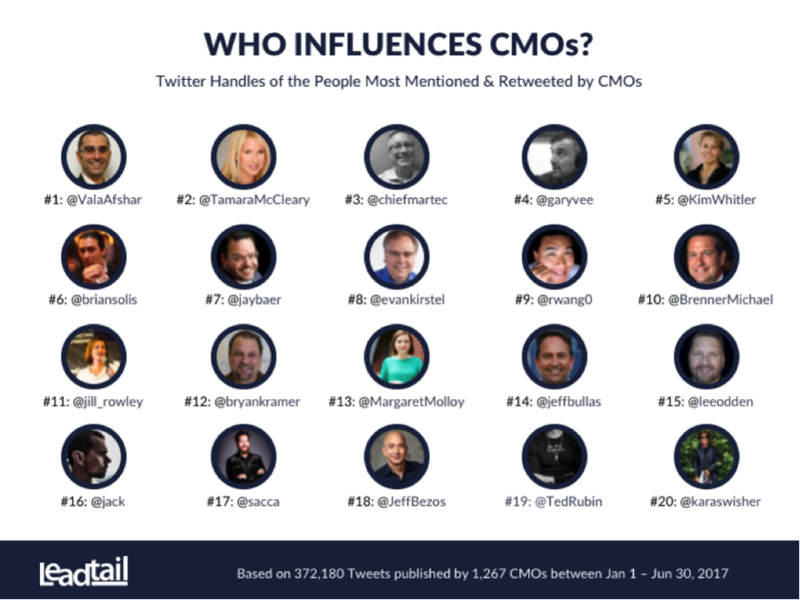 Who are the Top Influencers of CMOs? Karri Carlson, VP Social Insights at Leadtail, indicates: “We measured the people most mentioned and retweeted by our panel of CMOs to determine the most influential. As you look at the list of influencers, there is a constant thread that runs throughout the list—CMOs are primarily engaging with those who create thought leadership.” As the following examples illustrate, all are thought leaders and content developers, even though they may use different approaches to sharing that content. As one example, Scott Brinker (@ChiefMartec) has authored a book (Hacking Marketing) and has a blog that focuses on the intersection of marketing and technology. Tamara McCleary (@TamaraMcCleary) regularly posts (LinkedIn) and tweets about the different marketing conferences at which she attends speaks…. The below lists key changes in position for the top 10 since 2016. To read the rest of the article by Kim Whitler at Forbes, click here.